Mother’s Day is Sunday, May 13th and there is no better way to celebrate mom with food…that she does not have to cook! Don’t miss these fabulous brunches in the Denver-area and be sure to reserve early. Tall ceilings, striking chandeliers and reclaimed, eclectic décor provide an elegant yet comforting dining environment at Wild Standard in Boulder. The menu focuses on sustainable seafood with additional emphasis on seasonal, organic fruits and vegetables. Chef Bradford Heap takes pride in utilizing fishermen and farmers with sustainable and responsible practices. The Say Your Pisco (Pisco, Pimms #1, Pamplemousse Grapefruit Liqueur and lemon juice) and Love Potion #8 (Spring 44 Vodka, apricot liqueur, elderflower liqueur, lime juice and grenadine) provide a welcomed upgrade from the traditional mimosa. The Inverness will be offering its annual Mother’s Day Brunch in the award-winning Garden Terrace restaurant from 9:00 A.M. – 3:00 P.M.on Sunday, May 13, 2018. The cost is: $59.95/adult, $69.95/adult for the Champagne Brunch; $29.95/children 6 – 10 years of age, and FREE for children 5 years of age and under. The complete menu is available online, and reservations can be made by calling: (303) 397-6411. 200 Inverness Drive West, Englewood. Ocean Prime will open early for a special brunch and dinner beginning at 11:00 A.M. on Mother’s Day (Sunday, May 13, 2018). The restaurant has partnered with award-winning local chocolatier Robin Chocolates to offer all moms a special parting gift of gourmet chocolates. Reservations are required and can be made by calling: (303) 825-3663. ocean-prime.com 1465 Larimer St., Denver. If Mom needs a break from the traditional (ahem: fancy-schmancy) fine dining experience, she’ll love the comforting Mexican fare at La Sandia Mexican Kitchen & Tequila Bar in Lone Tree. The tables are rustic, the music is loud and the entire family (toddlers included) will feel welcome. Each mom will receive the bubbly mom-osa with her order. If Mom is ready to party, she’ll love the bottomless brunch bar. For $15 dollars, she’ll receive free-flowing cocktails including mimosas, Bloody Marias and strawberry margaritas. Must try dishes include the breakfast iron skillet (scrambled eggs, shredded beef, charros, potatoes and guacamole), Mexican chocolate waffles (cajeta, fried plantains, whipped crema and strawberry sauce), and the breakfast relleno de tamal (poblano stuffed with chicken tinga, fried egg, Jalisco sauce, charros and crema). If mom is needing a little indulgence this Mother’s Day, Tamayo on Larimar Square has just the thing. Their bottomless margarita brunch includes an unlimited number of brunch drinks and small plates. Start with papaya salad (Mexican papaya, grilled pineapple, jicama, spicy peanuts and chili lime vinaigrette), move on to mushroom huarache flatbread, enjoy an order of migas nortenas (tortilla chips, scrambled eggs, tomatillo-pasilla sauce, smoked brisket and crema fresca) and finish with pan dulce (Mexican French toast, chipotle-cajeta sauce, Nutella, bananas and crema fresca). Tamayo has teamed up with their neighbor, Wax and Lash, to give each mom 15% off any service at the neighboring salon. Simply show the Tamayo Mother’s Day brunch receipt to redeem. 1400 Larimer Street, www.eattamayo.com. Local Table Tours gives mom the perfect opportunity to experience a variety of dining destinations with someone else doing all the legwork. Offering culinary walking tours in Denver, Boulder and Fort Collins, Local Table Tours brings groups of food enthusiasts together for an exclusive taste of each town. The dining, cocktail, coffee & chocolate, farm to table and private tours offer unique behind-the-scenes experiences in the top restaurants and bars in each locale, all with the help of an expert guide. Each stop includes generous samples of each venue’s fare, as well as one-on-one time with the people behind the food. Mom just might meet her chef crush! Visit www.localtabletours.com or call 303.909.5747 to book a tour. 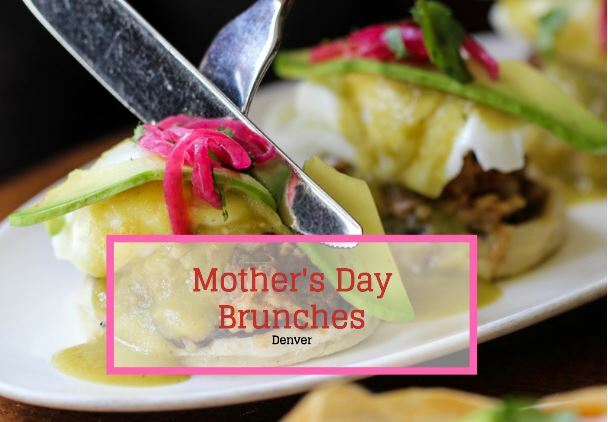 Celebrate your amazing mom with a special Mother’s Day Brunch at Social Fare Denver Dining + Drinks at the JW Marriott Denver Cherry Creek from 8 a.m. – 3 p.m. The price is $48 for adults and $24 for children ages 7-12. Kids age 6 and under can join for free! Families can enjoy a delicious brunch either indoors or outside, weather depending. Mom & Grandma can indulge in Bottomless Mimosa, Belvedere Spritzers and “Rosé All Day.”The kids will love the dedicated playroom where they enjoy movies, games and crafts, including a special Kids Decorating Station where they can create a special gift for mom.